* two arrays in a simple fashion. Note that when using sets you will only get distinct values, thus new Set[1,2,3,3].size evaluates to 3. My contribution in ES6 terms. In general it finds the intersection of an array with indefinite number of arrays provided as arguments. How about just using associative arrays? The performance of @atk's implementation for sorted arrays of primitives can be improved by using .pop rather than .shift. I created a benchmark using jsPerf: http://bit.ly/P9FrZK. It's about three times faster to use .pop. I recommend above succinct solution which outperforms other implementations on large inputs. If performance on small inputs matters, check the alternatives below. 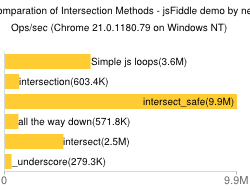 See the following snippet for alternative implementations and check https://jsperf.com/array-intersection-comparison for performance comparisons. check one by one from the index 0, create new array from that. Something like this, Not tested well though. PS:The algorithm only intended for Numbers and Normal Strings, intersection of arbitary object arrays may not work. var arrayContains = Array.prototype.indexOf ? It's pretty short using ES2015 and Sets. Accepts Array-like values like a String and removes duplicates. This isn't the very simplest solution (it's more code than filter+indexOf), nor is it the very fastest (probably slower by a constant factor than intersect_safe()), but seems like a pretty good balance. It is on the very simple side, while providing good performance, and it doesn't require pre-sorted inputs. // Calculate intersection of multiple array or object values. EDIT: I just noticed that this is, in a way, slightly buggy. That is: I coded it thinking that input arrays cannot itself contain repetitions (as provided example doesn't). index[v][i] = true; // Mark as present in i input. With some restrictions on your data, you can do it in linear time! For positive integers: use an array mapping the values to a "seen/not seen" boolean. There is a similar technique for objects: take a dummy key, set it to "true" for each element in array1, then look for this key in elements of array2. Clean up when you're done. A functional approach must consider using only pure functions without side effects, each of which is only concerned with a single job. These restrictions enhance the composability and reusability of the functions involved. Please note that the native Set type is used, which has an advantageous lookup performance. You wouldn't want to use this for 3D engine or kernel work, but if you have problems getting this to run in an event-based app, your design has bigger problems. .reduce to build a map, and .filter to find the intersection. delete within the .filter allows us to treat the second array as though it's a unique set. I find this approach pretty easy to reason about. It performs in constant time. Rather using indexOf you can also use Array.protype.includes. How can I find matching values in two arrays?